I did one of your workshops when I studied abroad in Canterbury. When will your album be available in the U.S.? iTunes won’t let me buy it and it looks awesome! I hope this track brings comfort to you. Thankyou for coming to Belfast. I probably won’t be there but I wish every success. Keep writing. Paper refuses nothing. Congratulations Hollie! We were routing for you at The contenders show and we’re so thrilled that you’ve won. Yey! The very best of luck. I just watched you on Artsnight on bbc 2 and I was wondering if you could tell me what your piece is called that you perform at the very end as the final credits start. I loved the poem on artsnight tonight. Where can I find it? Is it in your book? Just seen you on the Arts Night show. Being honest, I had never heard of you before but really enjoyed you and your poems. They touch a nerve of real life to me. Just ordered your book. Hi Hollie, I came and saw you when you toured in April and you read a poem about childbirth (and men I think?) Can you tell me what its called? Is it on youtube? Thanks! Heard you on Woman’s Hour, Hollie. You’re so young and I’m now surprised to find I’m in my 60’s but you spoke for me like it was just yesterday. I was in the same position as you and all the women I worked with cooed and kept up the deception. Just one person, a man, gently said something along the lines of ” your life will change”. I still look back and appreciate his honesty. Like you said , you saw yourself walking along the beach, all lovely. My husband, who had instigated the pregnancy, took fright and left. I was 30 odd and dumped. Pain, anguish. My son was such hard work and I had no friends or help. Fast forward and the reality of those days is still vivid. But now, I have a strong 33’yr old who loves and supports me when I need it. I never told him how it was. 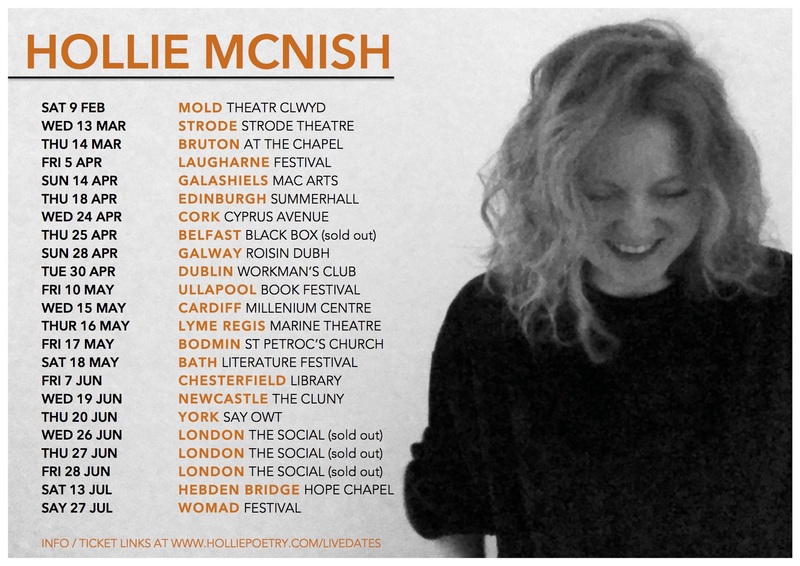 @Holliepoetry will you be performing in Leeds after Summer? I have a venue that is very interested and would love to speak to you about it? We absolutely love your work and would love to have you here! Sorry to be contacting you like this, I tried to reach you though Facebook but to no avail… I met you in Leeds last week at the University- I’d forgotten the copy of Nobody Told Me that I had bought for my sister who was giving birth the next day (Caesarian). Well, she’s had the baby and flippin’ awesome she is too! (In fact my niece is flippin’ awesome too!) I was wondering if there was a way that I could obtain a signed/dedicated copy from you? PayPal perhaps? Can’t thank you both enough for being so gracious and signing your copy of Nobody Told Me. You were very much the talk of the day! Hope That London was just as good for you/your audience. Just tried to buy Cherry Pie from Burning Eye, but wouldn’t take me beyond “a to cart”. Help. Just wanted to really say thank you for what i have read so far in Nobody Told Me. My wife saw you in Stamford and brought it back. It’s already made my life a little better. Also – it may be divided perfectly for reading on the toilet – which is pretty much my only quiet time. I hope it is safe to get that emotional on the dunny.